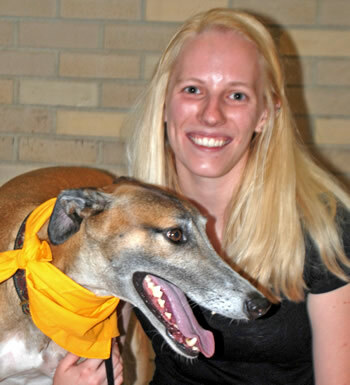 Raj is a greyhound who became a canine blood donor at MU’s Veterinary Health Center. After serving and saving fellow pooches, he retired as a donor and was adopted by a College of Veterinary Medicine (CVM) student. Now, Raj, along with his pet parent, Liz, is helping humans as a P.A.L.S. therapy dog. Raj and Liz Daugherty help manage the P.A.L.S. booth at the CVM Club Night 2017 on Aug. 30. 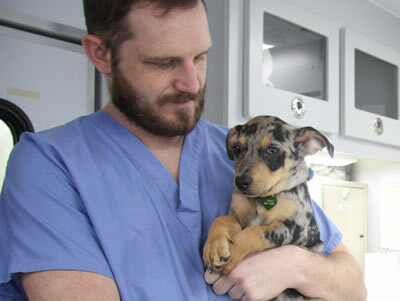 The Veterinary Health Center (VHC) at MU’s College of Veterinary Medicine sees thousands of cases every year. The Small Animal Emergency and Critical Care Service (SAECC) operates 24 hours a day, every day of the year, and treats an average of 16 cases per night. Just like humans, animals needing medical treatment sometimes require a blood transfusion. Donated blood is good for 30 to 42 days, so a blood bank is necessary to ensure that a sufficient supply and necessary types are always available, just like human medicine. To that end, the VHC maintains a blood donor unit of dogs and cats. Not every dog is a model canine blood donor. The ideal donor has blood type designation DEA 4, the universal donor type for dogs; weighs 50 pounds or more, without being overweight; is between 1-9 years old; has a stable, friendly temperament; is able to sit or lie still; is in good health and free of any infectious disease transmissible by blood, such as heartworm. Short-hair dogs are often preferable since their hair is easier to keep clean and less likely to pose a risk of bacterial contamination. Dogs with lean bodies and long necks with prominent jugular veins are also preferred. The canine jugular is the easiest collection point since this is the most accessible and least sensitive site in the dog’s body. A greyhound like Raj checks every box on the donor list. “One of the most important reasons to use greyhounds as donor dogs is that they naturally have more red blood cells than other breeds of dogs. That is part of why they are such good sprinters,” says Leah Cohn, DVM, PhD, DACVIM. Cohn, a professor and small animal internal medicine service chief, manages the VHC blood bank. In addition to their athletic pedigree, greyhounds are highly likely to have the “universal” blood type. Their size allows them to donate a full unit of blood. They tend to have a calm, friendly demeanor. All of the canine blood donors at the VHC are greyhounds. Liz Daugherty has always been a high achiever. She was a dean’s list student who earned a bachelor of science in biology, graduating with a general honors certificate and a dean’s certificate of achievement in biomedical sciences. She served as programming chair of Mizzou’s Pre-Vet Club, as a member of the Raptor Rehabilitation Project, a tutor at the MU Writing Center, and as an after-hours clinic crew SAECC assistant. She is a certified master SCUBA diver, has job-shadowed at two Kansas City vet practices and completed a four-month externship at Cape Wildlife Center in Massachusetts. Last summer, Daugherty participated in the Veterinary Research Scholars Program, in a mentorship with William Stich, PhD, MS, and a professor in the CVM Veterinary Pathobiology Department. Daugherty jumpstarted a project to create a universal tick-borne pathogen PCR diagnostic test for the Veterinary Medical Diagnostic Laboratory. This summer, she worked six weeks as a wildlife rehabilitation intern at WildCare Foundation of Oklahoma. Individuals of extraordinary achievement, like Daugherty, are a common phenomenon at the College of Veterinary Medicine. Yet, she differs from many of her peers in that she never had a dog or a cat as a child. Her pets were restricted to a few fish and a gerbil. “I joked during my Mizzou interview that the reason I wanted to be a veterinarian was to make up for the years of being denied pets,” Daugherty says. “It began in spring 2015,” Daugherty continued. “I was a junior, getting my BS in biology. I was also working on a minor in animal science, as well as a certificate in biomedical sciences, so an animal sciences class called Companion Animals fit both requirements nicely. The class required a companion animal-related service learning experience, so I chose to walk the greyhounds at the VHC. The first pair I chose to walk was Raj and his brother, Sheldon. Matt Haight is the senior registered veterinary technician for internal medicine. He is also responsible for the day-to-day operation of the veterinary blood donor program: selecting all of the dog and cat donors, ensuring their health and care, and performing all blood collection. He mentioned to Daugherty that people could put their names on a waiting list to adopt the greyhounds when their donating days are over. Haight is in charge of finding great homes for donor cats and dogs when they retire from service. After her companion animal class ended, Daugherty continued to walk Raj and Sheldon as a volunteer. She would sometimes take them to Speaker’s Circle or the Quadrangle on the MU campus and invite other students to interact with the greyhounds. National pet therapy programs abound, but Pet Assisted Love & Support — P.A.L.S. — is an organization whose focus and locus is local. Based at MU’s CVM, P.A.L.S. is a no-cost club for students, faculty, and community members who want to take their personal pets to visit patients at Columbia-area hospitals and senior centers. P.A.L.S. provides free training classes during the school year to prepare dogs and owners to successfully complete a behavioral test and physical screening they must pass to be certified and to receive a P.A.L.S. pet ID. Dogs must also pass the American Kennel Club’s (AKC) Canine Good Citizen® test. Once certified, the human/canine volunteer teams offer comfort, affection and understanding to patients, with the goal of increasing socialization and activity levels of patients, decreasing feelings of institutionalization, and providing the emotional support and unconditional friendship that pets impart. Therapy dogs are generally not service animals, which are individually trained to assist specific individuals with a medical condition or life-limiting disability. Service dogs enjoy access and protection under the Americans with Disabilities Act. Service dogs are not pets and are not encouraged to interact with people other than their owner while they are on duty. Therapy dogs provide psychological or physiological therapeutic benefits to people other than their handlers. Therapy dogs visit hospitals, nursing homes, hospice facilities, schools, child-care facilities, group homes and rehabilitation centers, but that access is at the discretion of the institution, and sometimes granted on a case-by-case basis. Therapy dogs do not have the same legal designation as service dogs; their owners do not have the right to be accompanied by their dogs in places where pets are not permitted. During spring semester 2016, Daugherty had finished her bachelor’s degree and was working to complete a minor in animal science. She lived on the east side of campus, so her daily walk to the Animal Science Research Center took her past the VHC. In addition to her animal science minor, Daugherty had to complete a certificate in biomedical sciences. She took an online canine rehabilitation class under Stephanie Gilliam, a senior veterinary technician and adjunct clinical instructor. “For my canine rehabilitation class, we had to do a project on a canine subject, evaluating their condition and conducting a full rehabilitation exam on them,” Daugherty says. “Of course, I chose Raj as my subject. In July 2016, her parents finally gave her the word: If she was selected to adopt Raj, they were fine with it. “I asked Matt where I was on the adoption list,” Daugherty says. “I was second, but he had already contacted the person ahead of me about adopting Raj. That person had not replied yet, but they still had priority. I spent the majority of August alternating between being convinced I had lost him, or hoping that the person at the top of the list would never respond. Daugherty thought the traits that made Raj an ideal donor candidate also gave him the potential to earn therapy dog certification. She began training him more rigorously in October 2016. In addition to their hikes, Liz and Raj practiced walking in a heel and responsive direction changes during excursions through Bass Pro Shop and Lowe’s. In January 2017, Raj became a Canine Good Citizen®, a designation that became an official AKC title in 2013. Daugherty and Raj now visit Candlelight Lodge Retirement Center. The special chemistry and evolutionary relationship between dogs and humans goes back tens of thousands of years. For most of those years, it was strictly a working relationship. Prior to the 1800s, dogs were functional accessories, used for tracking, hunting and guarding. Raj has been a best friend to the canine patients who relied on his blood for their treatment and recovery. He was a calming friend to a young woman striving for excellence during rigorous academic demands. Now, he is a sympathetic friend to the seniors he visits at Candlelight Lodge. Raj has proved to be a friend indeed.